Appearing from the United States Mint as the second of five 2013-dated releases of the America the Beautiful Quarters® Program is the 2013 Perry's Victory and International Peace Memorial Quarter. 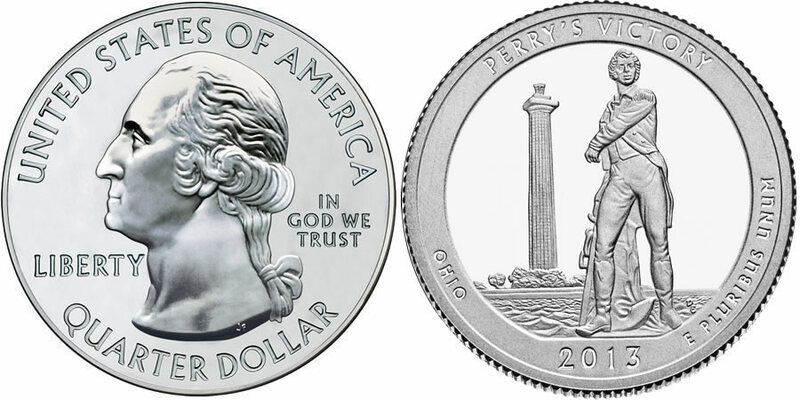 A design located on the reverse of the quarter is emblematic of Perry's Victory and International Peace Memorial located in the state of Ohio. In addition to being the second in 2013 of the series, this strike also marks the seventeenth in the program overall. A total of fifty-six new coins will have been issued in the series before it is completed in 2021. Each coin of the program depicts a unique reverse design emblematic of a selected site of national interest from one of the 50 states, the District of Columbia or the five US territories. The obverse of each coin remains the same and offers a portrait of George Washington, the first President of the United States. Perry's Victory and International Peace Memorial of Ohio commemorates the War of 1812 and specifically the Battle of Lake Erie. This battle was won by US forces under the command of Commodore Oliver Hazard Perry over British forces. The site also acknowledges the lasting peace that has remained between those parties involved (United States, Great Britain and Canada). Inscriptions of UNITED STATES OF AMERICA, QUARTER DOLLAR, LIBERTY, IN GOD WE TRUST and the mintmark are offered on the obverse of the coin. These inscriptions surround the John Flanagan portrait of George Washington which has appeared on quarter dollars (with minor variations) since 1932. A design on the reverse of the coin is emblematic of Perry's Victory and International Peace Memorial of Ohio. Surrounding that design are the inscriptions of PERRY'S VICTORY, OHIO, 2013 and E PLURIBUS UNUM.